Perhaps no other large animal enterprise offers as fast a turnaround on investment as hog raising. Range-raised pork is now sought out by the informed consumer concerned about issues of factory farming and willing to pay a premium to get a healthy, quality alternative. Klober’s four step system is as follows. First, farrowing is done in a central area that is regularly cleaned and disinfected between farrowings. There is no continuous farrowing and thus no perpetual pool of very young and lactating animals that are often the epicenter of health problems. Second, soon after farrowing, the sows and litters are moved to pasture or wooded lots. Third, each group remains intact through weaning, and this is done by removing the sows and leaving the pigs in a familiar environment to reduce stress. Finally, pastures or lots are then kept free of hogs for at least 12 months to break the life cycles of most pathogenic organisms and parasites. Are your curds and whey subverting the dominant paradigm? The premise of David Asher’s book is that while bakers, brewers, and produce fermenteers have found their way to incorporating wild microorganisms into their formulary, cheesemakers are still largely dependent on freeze-dried cultures produced industrially. I am on an earthworm self-education binge right now, and when I start on such a binge I often find it helpful to go back into history a bit. For example, I am halfway through both of Weston A. Price’s Nutrition and Physical Degeneration and William Albrecht’s Foundation Concepts as I write this. Reading these authors who wrote from 70 – 100 years ago gives me an important perspective regarding our present day concerns about topics like climate change and carbon sequestration. I didn’t know until recently that Charles Darwin was a major force in our understanding of the earthworm and its role in agriculture and humus management. He spent 39 years studying the earthworm before he published The Formation of Vegetable Mould, Through the Action of Worms, with Observations on their Habitats in 1881, right before his death. This book is hot off the press. I am a person who regularly devours Jerry’s articles in Acres, USA because they are so information-packed, so positive spirited, so thoroughly researched, and always based in the practical on-farm application. Brunetti’s writing (and public speaking) is always something to be sought out by anyone who is involved with grass-based agriculture. This book goes one step further in that it is relevant for the vegetable grower, also. Each of the 13 chapters takes a topic and discusses it at length including some deep scientific facts, some anecdotes about leaders in that particular area of science or its agricultural application, and some recipes for successful farm or garden management regarding that topic. Throughout there are recommendations for further research on any topic that piques the reader’s interest. The chapters are titled as follows – Soil as Supraorganism, The Mineral Nature of Soil, Trace Elements, The Biological Nature of Soil, Compost and Compost Tea, Foliar Nutrition, The Eternal Earthworm, Water: A Medium for Metamorphosis, System Acquired and Induced Systemic Resistance, Our Precious Pollinators and Predators, Cover Crops, The Tools of the Trade, and Back to the Future: a Permanent Agriculture. 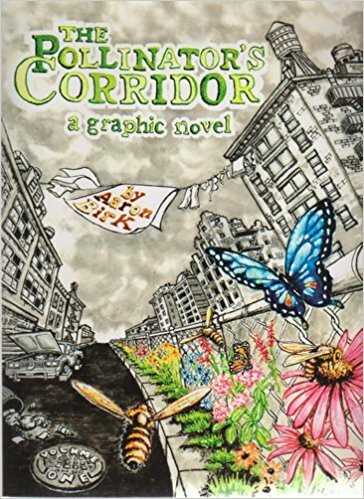 Set in the Bronx of the 1970’s landlord fires, The Pollinator’s Corridor follows the lives of three teenage friends who attempt to convince wild bees and butterflies to cross the Bronx by planting ‘corridors’ of native flora throughout the industrial wasteland. Connecting fragmented forests, watersheds and city parks, our heroes restore biodiversity to the blighted ghetto by uniting marginalized communities and laying the foundations of ecological health in an age of crisis and decline. 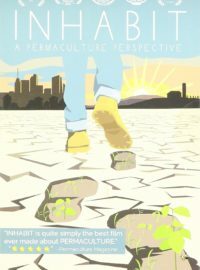 The story is especially relevant today where a lack of environmental leaders in the political world catalyzes concerned and caring individuals and communities to take action in their own spheres of influence, making change where they can and when they can. They reflect Birk’s mantra of resisting by action in your own work, refusing to stop the daily actions in your own life and finding inspiration in your creation, a pollinator’s greenway in this case. As many readers of The Natural Farmer know, Gabe Brown is the conventional North Dakota diversified farmer who learned the hard way how to transform a degraded, failing farm into a healthy, profitable one using the power of nature. This book is the “tell all” story of his journey. Gabe learned farming by working eight years with his father-in-law on a 1760 acre grain and beef ranch which was heavily tilled and herbicided, with the cattle subject to multiple vaccinations and pour-on insecticides. 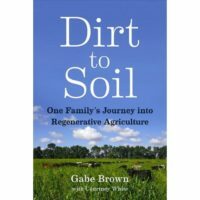 By the time Gabe and his wife Shelly purchased the home farm, Gabe was seriously concerned about these practices and particularly the condition of the soil. Their organic matter ranged from 1.7 to 1.9 percent, in an area of the upper Great Plains that had once boasted 7 to 8 percent. Water infiltrated at the rate of half an inch per hour, not fast enough to retain much of the only 16 inches of precipitation that fell there each year. If you have dairy animals and are thinking about starting a cheese operation, do your homework first. “The Small-Scale Cheese Business” offers a thorough roadmap for would-be cheesemakers and Caldwell shares her own experience as well as stories from other cheesemakers. The book will be helpful to beginning and established small and hobby-farm livestock owners and is an excellent guide for anyone wanting to improve his or her dairy practices and upgrade their on-farm cheesemaking infrastructure. Before making a significant financial investment in equipment and other infrastructure, be sure to review Caldwell’s guidelines for setting up a cheesemaking operation. Learn about forming a business, creating infrastructure and selling your finished products. Few animals on the farm are as charismatic and curious as the goat. Their attention seeking cries, soulful eyes and playful bounds win over visitors without much effort. Because of this, goats are often an early addition to a beginning farmer’s assets. But under the dog-like facade, goats are complex ruminants that require an advanced skill set and a close eye to raise successfully, especially when being raised for food production. 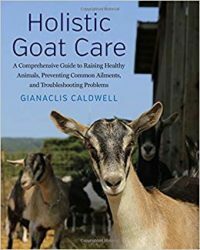 Books like Holistic Goat Care are a godsend for when the inevitable health problem arises, and the newbie goat owner needs a crash course in health care. Caldwell reflects this sentiment in her introduction, recalling her own personal learning curve as she transitioned from pet goat owner to dairy goat owner and conventional medicine user to holistic care giver. As a goat dairy owner, she uses examples from her own experiences as she takes the reader through the five parts of goat ownership; Starting Out Right, On the Farm, Managing Herd Health, The Productive Herd- Making Babies and Milk, and Solving Goat Health Problems. If you are interested in any aspect of Medicinal Herb Farming, this is the book for you. It’s well organized, beautifully written, loaded with information, discusses many important environmental issues and most of all inspires the reader. Preparing his Eagle Scout project, my son was charged with preparing a report that any person could use as a guide to complete the whole project on their own This book does just that for the Medicinal Herb Farmer. But this is more than simply a how-to book. 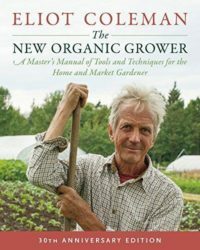 The authors have woven their own story and thoughts about sustainable and organic farming into each chapter so the text is interesting and a pleasure to read. I marked many passages to revisit later and found the text encouraging and realistic. This is pretty much the book Eliot wrote 30 years ago. There are some updates and new passages, but not a lot. You could say the lack of major changes by him is proof that he did a great job the first time, and you would be right. But I was particularly interested in reviewing this anniversary edition to see if Eliot included any of the new thinking on tillage, information on the role of soil microbiology in plant nutrition or excitement about regenerating land while mitigating climate change via soil carbon sequestration. This is a scholarly work, published by a university professor for use in university classes. So if you are looking for a soft read, look elsewhere. 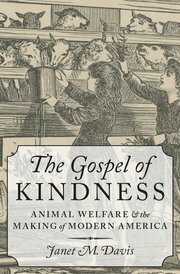 If, however, you are looking for a detailed factual history of the origins of the animal rights movement in America, its growth and close relationship to many other re-form movements like abolition, temperance, and suffrage, and its fascinating role in establishing a litmus test by which national assimilation was ascer-tained, you will want this short volume. Those who are interested in the mythology of American exceptionalism, that belief in the uniqueness and benevo-lence of America’s republican political institutions, will find much to ponder in its shared history with animal welfare concerns. Although there were clear precedents in such conflicts as Puritans versus Royalists regarding animal sports in very early 15th century England, and the Massachusetts Bay Colony’s adoption in 1641 of a Body of Liberties which prohibits “any Tirranny or Crueltie towards any bruite Creature which are usuallie kept for man’s use”, Davis places the origins of animal protectionism in the Second Great Awakening, that Protestant religious revival movement which swept America from about 1790 to 1840. As a part of the much larger Romantic movement, that Awakening rejected rationalism and deism in favor of enthusiastic emotion and a direct relationship with God. One outward sign of that relationship, according to Davis’ reading of the period, was a concern with animal mercy. 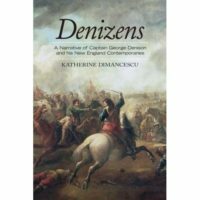 In about 40 essays, Denizens offers a series of narratives showing how the author’s seventeenth-century southern New England ancestors participated in the history of their times. In reading the book, we learn about a variety of features of life in those times in parts of Massachusetts, Connecticut, and Rhode Island, including a few things about food, drink, and agriculture. One of the author’s ancestor’s, William Cheseborough, settled land including salt marshes on the banks of Wequetequock Cove, in present-day Stonington, Connecticut, because “salt marsh hay was prized as a food source for livestock until grazing pastures could be established.” Online, I found various sources expressing concern about the health of salt marshes of the Northeast. In early colonial times, the health, and even survival, of human beings may have depended on using salt marsh hay for fodder. The purpose of this book, Alex says in the foreword, is to inspire people to use natural organisms to clean up human waste of all sorts. Fungi are particularly well adapted to this task of decomposition, he asserts, and this book is to serve as a guide to how to use them for this function. He starts off making sure we are aware of the vastness of the problem of waste. Hazardous wastes, those that can cause “substantial threats to our health and the environment” are produced at the rate of 400 million tons per year. That comes, he says, to about 13 tons per second! These come from common products like batteries, cosmetics, cleaning products, paints, pharmaceuticals, and electronics. The US has 200,000 “superfund sites” that are unusually high in hazardous waste, whose cleanup will cost an estimated $1.7 trillion over the next 30 years. The scale and expense of this problem and its current technological solution make it daunting. One of the major techniques now used in such clean-ups is bioremediation with bacteria and plants. Dorr asserts, however, that mycoremediation can serve this role far more successfully and economically. He displays a graph from Paul Stamet’s book “Mycellium Running” which seems to demonstrate this advantage. 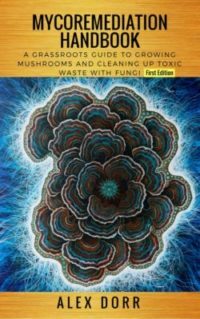 The next part of the book is devoted to showing how fungi (mushrooms, yeasts, molds, and mycelia) can degrade and remediate metals, chemicals and microbes. This is an important book. Druker, a public interest attorney, sued the Food and Drug Administration (FDA) in 1998 to get to the bottom of why and how the agency made the determination that foods derived from genetically modified organisms (GMOs) were “Generally Regarded as Safe” (GRAS) when there was clear scientific evidence that they could not be regarded as safe. The memos and internal documents he uncovered, along with the other evidence presented in this book, tell a chilling story of how business interests have corrupted our political leaders and many within the science community. The front cover clearly states the goal of America’s Two-Headed Pig: to explain how to go about treating nutritional deficiencies and disease in a genetically modified, antibiotic resistant, and pesticide dependent world. Author Leah Dunham is the daughter of a veterinarian and as such grew up seeing her father diagnose and cure herd illnesses through providing cattle with proper nutrition. As this book clearly describes in great detail, however, proper nutrition is a lot harder to come by and has been getting even more difficult in the more recent years as politics, money, and health collide. by Laura Ten Eyck and Dietrich Gehring published by Chelsea Green Publishing, 2015, www.chelseagreen.com $20.93, paperback, 266 pages. To any gardener or farmer interested in growing hops; to the beer aficionado curious to learn the bubbly beverage’s thick history; to the social scientist studying the local trends involved in the craft-beer movement—allow me to introduce you to Laura and Dietrich. Laura, a beer blogger who works in the New York State Farmland Conservation office, together with her husband Dietrich, a beer salesman and avid brewer, have insightfully written The Hop Grower’s Handbook. I have always wished that I had taken advantage of my proximity to Lynn Margulis during the many years she was a professor at UMass before her death in 2011. The time never seemed quite right to interview her on agricultural aspects of microbial behavior, and then, before history had a chance to recognize her Nobel-quality contribution to evolutionary biology, she was gone. This documentary is a tribute to her insights and her willingness to share them. It is composed of many photos and clips of Lynn throughout her life, explaining her work, and of her colleagues talking about her and the revolutionary impact she had on science. Fisher has been employed in the anti-hunger movement for 25 years as researcher, organizer, advocate, and executive director of national and local food groups. He has worked successfully in coalitions to obtain passage of many federal food and nutrition programs. Yet he has developed a critique of that movement for its failure to ask basic questions and press for fundamental change. 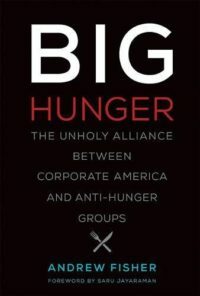 Instead, he asserts here, too many in that field have become part of a self-perpetuating “hunger industrial complex” reliant on charity from many of the same corporations whose labor practices have fueled the economic problems driving hunger in the first place.